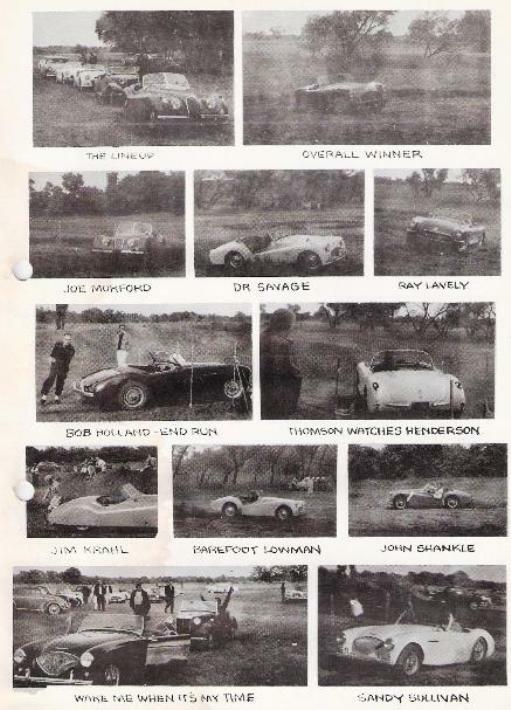 In 1957 the region held its "Second Annual Gymkhana" the only speed event that year. It was a true Gymkhana in the British tradition, featuring "garages" , backups, clover-leafs, LeMans start and finish. Additionally it was held on dirt. Below is the event article from the November, 1957 Gasket Gazette. "Believe that we can truthfully say that the second annual Gymkhana was a huge success, including financially. The ones of you who missed the timed races with a Le Mans Start should feel like a drunk in a gutter with bugs (mitey low). Because of the size of the entree list (37 compared to 16 last year) we could give each "Farm Yard Nuvolari" only two runs. Sorry that Bug Berg couldn't make it as his tired old eyes would have lit up like the boys on the burning deck if he could have seen the way this event 'grew up" in the period of one year. Practice started at 10:A. M. and Timed Runs at 1:30 P.M. Louie Carroll was the first off with John Stone bringing up the rear 31 cars later. Believe me there was a lot of dirt, markers and sod chewing in between. From a tractor's eye view here is the way the course was run. After touching the timer you ran to your car, got in, fastened safety belt, started engine, released emergency brake, dropped it into low gear and pushed your right foot through the firewall, (that's if you missed the accelerator) otherwise you floor-boarded it into the esses around five markers then into a garage forward, reverse out around a marker and into another garage. Forward out of this garage into the loop the loops, a right, a left and a right around 3 separate markers, Then right into the cloverleaf - - three left interlocking loops. Out of the last loop down the backstretch into another garage forward, reverse out around three markers into another garage. (Almost home, you've got it made now.) Forward out of garage between two markers and down the straight to the finish. Approaching finish you must brake hard, stop between (just front of car) two markers a yard apart. Stop car, set emergency brake, jump out and (wait - - undo safety belt - you're taking car with you) run to timer to stop the time." There were only three classes, Over 1600 cc, Under 1600 cc and Touring (Sedans of any displacement). The winners of each class are listed below and are considered the Year End Champions since this was the only event held. It should also be noted that the same classes were used for Rallyes.